Lettuce (Latuca sativa) is a cool season annual in the Compositae family, which includes endive, escarole, chicory, globe artichoke, sunflower, Jerusalem artichoke, salsify, and burdock. Looseleaf- var.crispa. First to maturity, these fast growing lettuces do not form a head. Good for babyleaf culture. Butterhead – also known as bib, or Boston, this type forms a loose head with slightly oily leaves. Beautiful, sweet and tender, but bruises and tears easily. Romaine – var.longfolia. Romaine forms a tall dense upright head with a tender heart. It tolerates warm temperatures and is less prone to bolting. Iceberg – var. capitata. The fussiest type to grow, iceberg will form a compact round head if given a long cool season. It bolts easily if stressed. Choose cool, well drained, loose soil with pH 6.2-6.8. Lettuce is sensitive to low pH. Use 50-75lbs Nitrogen/acre, ~150 Phosphorus and Potassium/acre. Sidedress with N 3-4 weeks after planting. With transplanting, use 2lbs/50 gallons starter fertilizer, 4-8oz per plant. 1/8”, seeds require minimum amount of light for germination. Babyleaf – ~60 seeds/ft, in 2” bands. Full size – ~3 seeds every 8-10”. Babyleaf – ¾” between bands, 16 rows/36” bed. Full size – 12-18” or 3 rows/36” bed, 5’ centers. 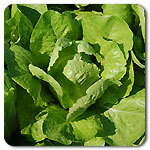 Lettuce can be seeded in the spring as soon as the soil can be worked. Days to maturity are from direct seeding in spring conditions, subtract 10-14 days if transplanting, subtract 7-10 days if planting in summer conditions, add 20 days if planting late summer-fall In certain areas, lettuce can be grown throughout the summer by choosing varieties which are heat tolerant; however, many lettuce varieties have difficulty germinating in soils above 75°F. Start transplants 3-4 weeks before setting out. Sow seeds 4 per inch in flats or small-cell plug trays, barely covering with fine soil. If sowing into flats, transplant 2 weeks later into plug trays, pots, or into another flat at 1-2” apart. Harden off seedlings by reducing water and temperature for 2-3 days before transplanting. Choose cold tolerant varieties to withstand light late-season frosts. Keep moisture levels even. Drought stress can cause bolting. Choose heat tolerant, bold-resistant varieties (such as Batavian types) for summer plantings. Baby Leaf – 96M seeds/100’ bed (~ 4 oz), 960M seeds/1,000’ bed (2.5 lbs), 7.7MM seeds/acre (~20 lbs), using ~960 seeds/ft, 16 rows/bed, 36” beds, 6’ row centers. Full Size – 360 plants/100’ beds (~1/32 oz), 3,600 plants/1,000’ beds (1 oz), using 10” spacing, 3 rows/36” bed, 5’ center beds. 31M plants/acre (~2 oz), using 10” plant spacing. These specifications are meant to be general guidelines for the particular application as noted. 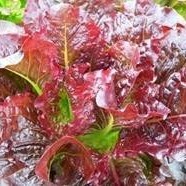 They can be loosely applied across the board for lettuces/mixes found in this section. Cut lettuce holds best when harvested in the morning and cooled rapidly. For salad mix or baby leaf production, harvest individual leaves when they reach desired size, or cut evenly across the bed making sure to stay above the growing tip. For a continuous harvest, sow lettuce every 3 weeks.